a blog by sam christie. former home of "12 Months of Stuff"
I Did Not Build A Website This Month. Here’s Why. 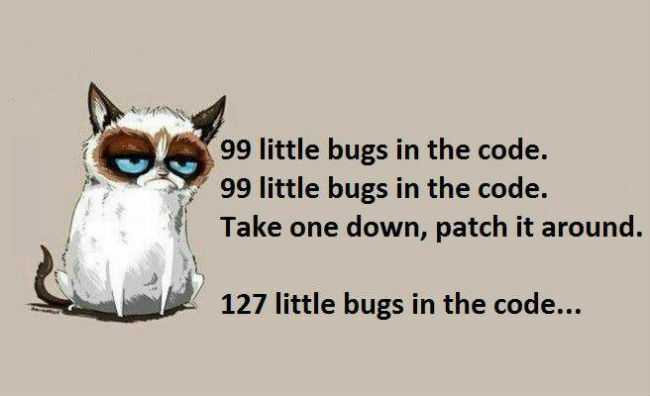 Photo via http://weknowmemes.com/wp-content/uploads/2014/04/99-bugs-in-the-code.jpg featuring Grumpy Cat. Well, that wasn’t a total failure. I set out this month to build a blog in Ruby on Rails. I didn’t end up building the blog, but I did learn some Ruby and do some introductory projects. It was all going well and then it suddenly went off the Rails. Womp womp! In any case, I learned something. That’s going to become my motto I think :). This isn’t fun. I am not happy doing this. I am not enjoying this. All future projects must directly contribute to my happiness. I started these 12 projects to “get to where I want to be”, but I’m starting to find that destination is a bit nebulous. Sure I want to have my own internet content empire, who doesn’t? But if it makes me miserable, then there’s no point to it. I need to focus on the fun parts, and figure out how to outsource or get around the parts I don’t enjoy if necessary. Enter the above decree. At least I’m learning things, right? “Inspect and adapt”, as they say. Stay tuned for June’s stuff announcement shortly. It’s going to be a good one. Whew. It’s been rough the past few weeks. You know the drill – life gets in the way, things get shuffled around, your 12 Months of Stuff project is the thing that gets pushed aside. Well I’m back on track and jumping in feet first to may’s project: Building a website. What’s the site gonna be? The plan is to use it in June’s month of stuff. For now, here’s a handy intro video.